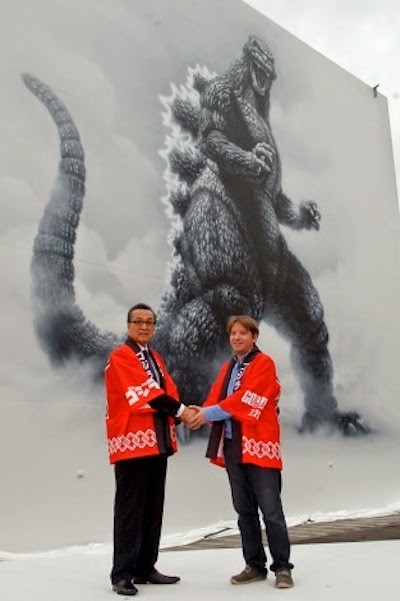 UNVEILING TOHO STUDIOS' "GODZILLA" MURAL! The 11-meter mural unveiled by Takarada and Edwards this morning. 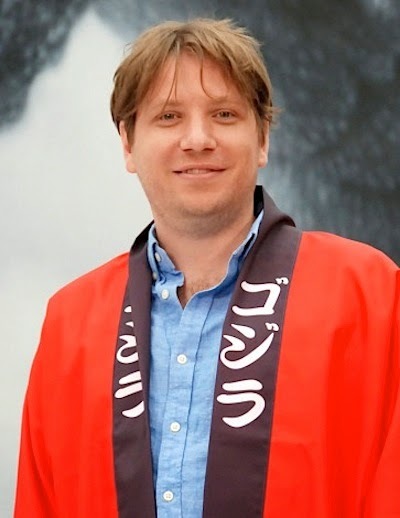 Following up on my May 11th report on Toho's new mural, there was an official "unveiling" this past morning at the studios with the star of the first Godzilla film, Akira Takarada, and the director of the latest film, Gareth Edwards, acting as the "hosts" dressed up in special Big G happi coats. Interestingly, the mural was not originally intended to celebrate Godzilla's 60th Anniversary this year. Reunited for the first time since the production of GODZILLA (2014). Painted by Masao Hanawa, the mural was commissioned to go along with similar murals featuring scenes from Ishiro Honda's MOTHRA (1961) and Akira Kurosawa's SEVEN SAMURAI (1954), while the aging Toho Studios was undergoing numerous renovations, major facelifts, and upgrades to the studio grounds and buildings, which had been constructed, originally, in the 1930s. Edwards, director of GODZILLA (2014), called the mural, "fantastic." 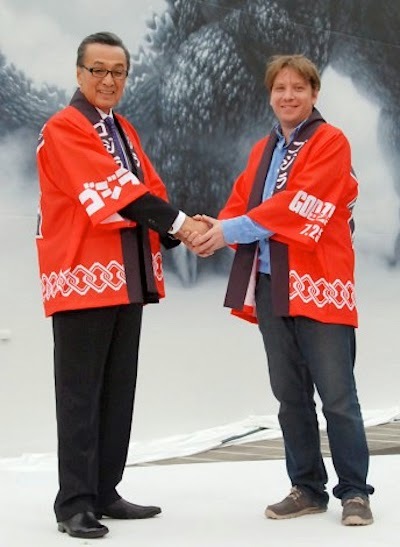 But, in the wake of the Tohoku Earthquake and Tsunami of 2011, work was postponed on the proposed Godzilla mural. So, in light of the 60th Anniversary and the release of the Edwards' production, Toho brought back Hanawa to move forward on the project. The famed painter not only created the SEVEN SAMURAI mural, but was also the art director of Tokyo DisneySea Resort. 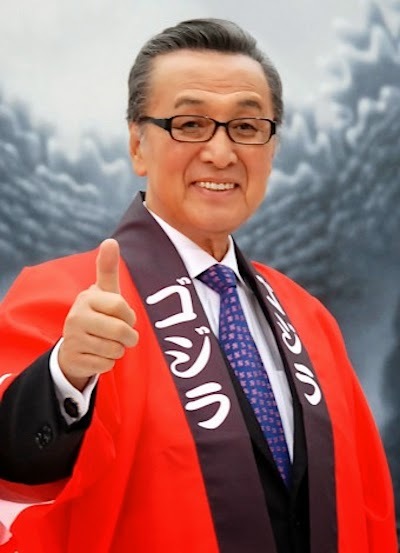 Takarada's opinion of Hanawa's work was, "Subarashii" (wonderful)! Using the 1994 Big G as his model, featured in Kensho Yamashita's GODZILLA VS. SPACE GODZILLA, the mural reportedly took three months to complete at the cost ¥8,000,000 (roughly $78,000 USD). Completed on May 31st, Godzilla will now stand over the front gates of Toho Studios into the foreseeable future — hopefully, where he continues to reign as the once and future King of the Monsters. Click to watch Masao Hanawa at work on the Godzilla mural.